repinc updated the task description for T9066: Akademy 2018: Promo BoF. repinc added a comment to T7680: Promo Sprint: Sign up. repinc added a comment to T7450: Promo Sprint: Place. repinc added a comment to T7317: Promo Sprint: Time and Place. I have no date blockers in first quarter of 2018, so far. repinc added a watcher for Automotive: repinc. repinc added a comment to T5969: [Content] Brainstorm topics. Another thing that I was doing when I had much more time... I had several KDE-related searches open for posts (like Automotive and similar hashtags and kde.org domain) and I monitored what people were posting about us. And if they made a positive comment I liked ut, if not reposted it. And I tried to help if they had a problem. repinc added a comment to T5973: [Policy] Tweeting/posting guidelines for virality. But I guess this should be opened as another issues on how to improve our webistes? 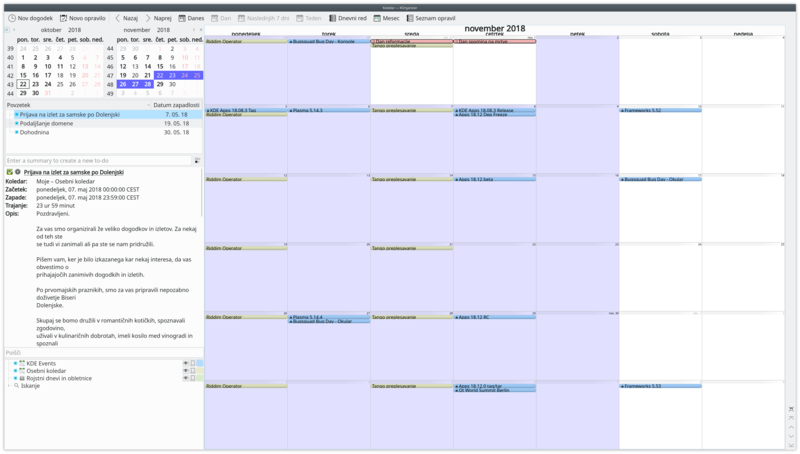 repinc added a watcher for KDE Promo: repinc. repinc committed R172:a621d2ac8429: Updated Slovenian holidays (authored by repinc). repinc committed R172:db5766a0ab90: These files were removed from kdepimlibs (authored by repinc). repinc committed R173:a621d2ac8429: Updated Slovenian holidays (authored by repinc). repinc committed R173:db5766a0ab90: These files were removed from kdepimlibs (authored by repinc). repinc committed R108:ec8a1b20cf5b: Fixed a typo (authored by repinc). repinc committed R108:9cfe2badba4b: Fixed typo in notification sound filename and fixed some notifications to use… (authored by repinc).